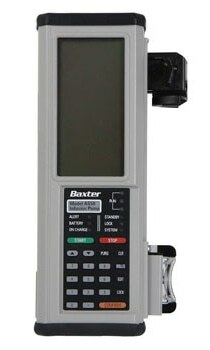 The Baxter AS50 is a digital syringe pump that provides accurate infusion of intravenous solutions, drug solutions, whole blood, and packed blood cells. The following routes of adminstration are indicated: intravenous, intra-arterial, epidural or subcutaneous. It accepts standard disposable syringes from 1 mL to 60 mL.